What Does The Cricket Really Say? I had an interesting question via email from a reader. I suppose this has something to do with a) interest in the way people who speak different languages name the sounds animals make b) the coming of summer. QUAERITUR: What is the Latin for the sounds crickets make? In English we say, I think, that crickets "chirp". But birds also "chirp". They tweet as well, which gave rise to my saying that I send out "pipata" via Twitter. (Latin pipata, or "tweets" from pipio "to twitter, chirp"). Follow me on Twitter, btw. But crickets do something else. In Latin a cricket is a gryllus or variously grillus. In Italian we still say grillo. The preferred verb used by ancient writers (cf. Pliny, Catullus) for the chirping of a cricket is strideo. Grylli strident. Your personal copy of the mighty Lewis & Short Dictonary divulges with just a few flips of its invaluable pages that strideo means "to make or utter any harsh, shrill, hissing, whistling, grating, or creaking sound; to creak, hiss, whizz, whistle, rattle, buzz". The verb strideo calls to mind the harrowing image brought given us by the Lord Himself who said, of those who wind up on the wrong side of judgment, that they will wind up in a place where – in the darkness – there is the sound of weeping and stridor dentium… the creaking sound made when you grind your teeth together… very hard. Fletus et stridor dentium. Luke 13. But back to our happy little crickets who strident all the time, and even tell us the temperature. A cricket or grasshopper or cicacda, all of whom strident, are described in the act of chirping with the adjectives argutus… arguti, or even garruli. Garruli strident grylli, ut nobis de calore nuntient. So, that, friends, is that about the sound crickets make in Latin. This entry was posted in ASK FATHER Question Box, SESSIUNCULA and tagged crickets. Bookmark the permalink. 16 Responses to What Does The Cricket Really Say? This is one for the Recusant Cricket Club surely. How do crickets tell us the temperature? Inquiring minds want to know. Of course, if the grillos are particularly tuneful, they sound like this. Gryllus grillat: Philomela modulatur: Aquila clangit: Accipiter pipat: corvus crocitat, crocit, corniculat. Perdix cacabat: Anser, gratitat, glacitat: Cycnus drensat. Turtur et Columba gemunt: Palumbes plausitat: Ciconia gloterat. Gallus cucurrit: Gallina gracillat, glocit: glocitat. Pavo pupillat: Grus gruit, Vultur pulpat. Graeculus frigulat: Milvius lipit, lugit. Anas tetrinit: hirundo trinsat. Passer pipit: Sturnus pisitat. Turdus trutilat: Acredula mittat. Coturnix grylissat: Galgulus glocitat. Merula stridet vel modulatur: Upupa popissat. Meleagris caccissat: Vespertilio stridet. Pica picatur: Cuculus cuculat. Bubo bubulat: Noctua cucubat. Ulula ululat: Buteo bubit. Regulus zinzilutat, Parus tinninat. Sus grunnit , ovis balat , serpens sibilat , rana coaxat , canis baubat vel latrat , vulpes gannit. There’s a lot more but for brevity’s sake I’ll skip’m. Patikins, Yes, very cool. Who knew? We’re never too old to learn something new. Thank you for the reply & the cricket link. The sound ducks actually make is as close to “Frank” as it is to “quack”. It’s actually nearly identical to saying “Frank” in a creaky/nasally voice and then cutting off the F and the K. Rehng rehng rehng! “Grillo” is also the Spanish word for “cricket.” I once attended a concert in Madrid that included experimental music from the 1920s, during which time it was popular in vanguard circles for a performer to come out and declaim some odd bit of poetry while an instrumentalist plonked away behind her. The concert in question featured a black-clad woman who stood in a dramatic pose in front of the piano and recited in a rather sepulchral voice, “Estribillo, estribillo, estribillo / es el canto del grillo.” Estribillo means refrain or chorus. And when I thought about it, that’s exactly what the song of a cricket is: a constant refrain. Delightful! And thanks to the erudite Andrew! Not quite so innocent. 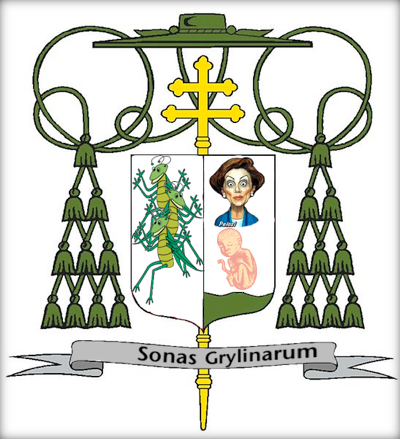 Looks like Jeff Miller, a/k/a The Curt Jester, put the Latin lesson to use for a faux coat of arms for Archbishop Niederauer. See the full text of the post for his explanation. Erudite? No. I am pretty good at copy and paste, however. This was mostly taken from “Sancti Isidori Hispalensis Episcopi differentiarum libri duo”. A very interesting book full of acute observations. The Bible text is also replete with animal sounds. Donkeys, oxen, lions, horses and others are featured in various book of the Old Testament. Also a lion roars in the Apocalypse. Thanks for the El Grillo link. Wonderful song. “Pavo pupillat”. “Pavo the Peacock is named after his voice”, translates T.H. White in his ‘Bestiary’ (1954) but, alas, does not explain why his 12th-c. Author says that. (I have not yet turned my feeble on-line skills to trying to discover if the MS. CUL II.4.26 or M.R. James’s – or any more recent – edition, is on internet.) What got me thinking about Pavo again was recalling some English-language version I once saw of one of Anouilh’s plays where a character is named ‘Leon'(or ‘Leo’?) and the peacocks seem to call or cry his name.